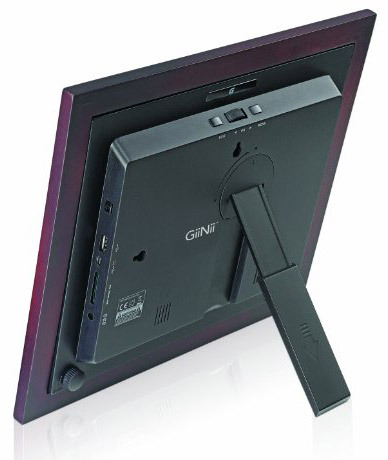 I recently had the chance to play with GiiNii's 8-inch "All-In-One" digital picture frame (Model: GH-8DNM), I know all of you are thinking, "Not another digital picture frame!" 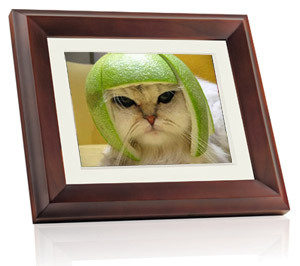 but this one is was fun and easy to use, unlike every other digital picture frame I've used before.So Easy It takes all sorts of media to grab pictures from; if it can hold data that can be used with the "All-In-One". SD cards, multimedia cards, XD-picture cards, USB flash drives, and even cameras that are USB compatible... say goodbye to transferring files to the computer first! It also has nice controls. A small scroll wheel on the top of the frame, together with an ESC and MENU button are all the controls needed to navigate the idiot proof menus. I first thought the home screen would get annoying because the icons had no labels, but I didn't realize how intuitive GiiNii made the controls. I have to admit, the scroll wheel didn't respond every time I clicked it, but you're going to be using the included remote control most of the time anyway and I had no problems with that. It seems like "All-In-One" while somewhat of a haughty title, is very apropos, and it is the reason I'd recommend this frame despite the fact that it can run around $100, which I agree is a bit steep. What do I mean? Well, this frame is much more than just a frame with tons of features; it's more like a media-specific computer. Instead of using your computer to watch videos from your camera or listen to the latest song you downloaded to your Blackberry SD-card on inaudible speakers, you just end up doing it all through the "All-In-One". So I'm not saying pay $100 dollars for a picture frame, but pay $100 for a very big, capable media player.